Opening Day is always such a special, hopeful day for us. We look forward to reconnecting with old friends, meeting new ones and sharing the hope that this year, maybe this year, the Cubs will finally reward us with that seemingly elusive prize of a World Series. 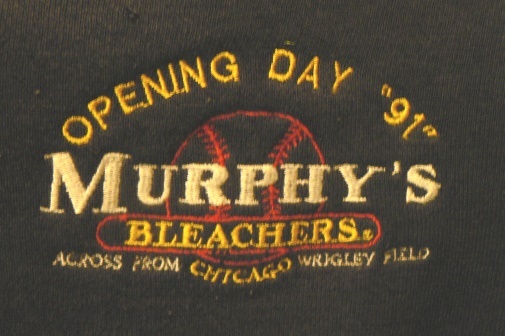 To celebrate each Opening Day, Murphy’s Bleachers has produced a commemorative sweatshirt every year for over 30 years. Robert Bjork, a 57 year old Marine veteran, couldn’t afford to buy a new Opening Day sweatshirt. In a creative bid to obtain one, he offered to swap his vintage 1991 version for a new 2014 hoodie. 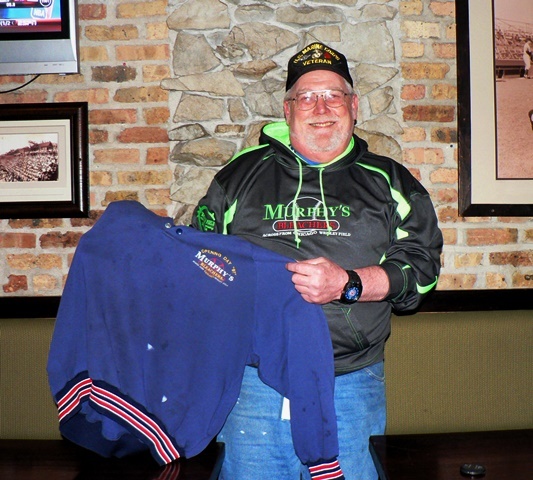 Touched by his story and his long-time support of both the Cubs and Murphy’s Bleachers, Beth, Brian and James Murphy decided to take him up on his offer and, in the process, add another item to the extensive collection of memorabilia displayed throughout Murphy’s Bleachers. We think you’ll agree, the new version looks great and hopefully, Robert, along with Cubs fans all around the world, will have something to celebrate this year! If you want to purchase the Opening Day sweatshirt either visit our online store or click here.